I've been in Hong Kong for a couple of days and it has been a complete whirlwind - but of course you don't make a trip to the true city that never sleeps expecting a leisurely vacation! Every time I return to Hong Kong there appear to be about fifty new high rises, sprouting magic beanstalk-like out of the cityscape; about a million more people navigating the streets, subways, and stores with a speed and efficiency rivaling the human circulatory system; and oh, I don't know, about several million more feet of neon everywhere. I do love it here, and the fact that Hong Kong celebrates the holidays with such visual panache and culinary gusto almost makes up for my abbreviated Christmas baking season this year. It's hard to feel pastry-deprived when the streets are almost literally lined with bakeries and gourmet stores selling everything from French pâtisserie to traditional Chinese sweets to European chocolates. One thing I haven't seen yet, though, are fresh, honey-sweet, buttery-fragrant caramels like the ones that have been sweeping through the blogosphere this year, and that I made before I left on vacation. Cut into individual pieces, sprinkled with Hawaiian sea salt in a festive red, and wrapped in wax paper, they are the perfect treat to scatter across the holiday party table. These caramels are adapted from Alice Medrich's recipe for honey caramels in Pure Dessert , which makes more than enough for you to squirrel a few away for personal indulging after giving out the rest. Although the recipe calls for corn syrup, this is mainly to help keep the caramels soft and pliable instead of turning hard and brittle, and you can eliminate it if you wish. Medrich suggests trying different honeys with this recipe; I like lavender or wildflower. If you are using a light, sweet honey, you can reduce the sugar by a third of a cup - I like to let the honey flavor come through without being overwhelmingly sweet. Also, be sure you get the caramel to at least 250 degrees, which is hard ball stage - otherwise, the resulting caramels may not set up and will be too soft to cut properly. If you find your caramel is still too soft after letting it set up, you can dump it back into the pot and heat it up again - a great little save. Try cooking it to a few degrees higher to make sure it sets up firmer. I hope all of you are enjoying the holidays - even though my oven isn't on, I'm still enjoying myself! Line the bottom and sides of an 8 or 9 in baking pan with foil or parchment paper. 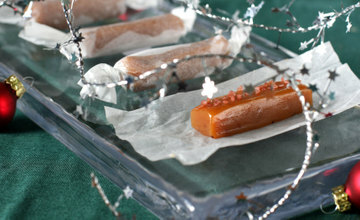 Let the sides of the foil or parchment hang over the sides of the pan; this will make it easier to remove the caramels. In a large saucepan (use at least a 3 quart saucepan, as the boiling caramel will increase in volume), combine the corn syrup, honey, sugar, and sea salt, and bring to a boil. Let the mixture continue cooking until it reaches 305 degrees F.
When the caramel is at the right temperature, take it off the heat and add in the butter, stirring until it is melted and combined. Add in the cream slowly - when you pour it in it will bubble up violently, so don't add the cream all at once or it might overflow. When you have added all the cream, stir the mixture until combined. Return the saucepan to the stove and cook on medium heat until it reaches 250 degrees F.
Pour the caramel into the prepared pan. Let it set overnight before removing and cutting into individual pieces. Sea salt caramels are my fave! Yum. Can't wait to hear more about Hong Kong - I think I'm headed there in April! I was just thinking it's been a while since I made a batch! I wonder if Santa willbe kind enough to give me this book for Christmas!! They look wonderful! I've not seen caramel bars like this before = divine excess! I wouldn't dare to make them. You and I ...we're Alice Medrich obsessed! It's hard not to be when Pure Dessert has such great recipes. I shall make these soon. Yours look sooooo good! I just finished making a batch of this. I hope it turns out! I don't have a candy thermometer - just a meat one. And it's temp stops at 220! Hopefully I got it hot enough and it'll set up...fingers crossed! Oh yum Anita! I so want to make these using my huckleberry and raspberry honey! The sea salt gives it a little something extra too. oh my these look and sound wonderful, especially with the touch of Hawaii in there (wink!) Enjoy HK! This looks great, next stop Alice Medrich's Pure Dessert! These are sinful and beautiful, Anita - like everything you do! Enjoy your trip, dear! 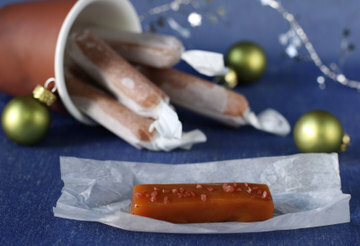 I'm planning on making caramels tonight, but now I'm tempted to use this recipe!! I love the red Hawaiian sea salt here. I've been obsessed with trying new salts lately. Wow, Anita, those look like the Idea of caramel. Have fun in HK. Headed there this summer. Can't wait. Glad you are having a great time in Hong Kong. Your caramels are divine. I am a caramel addict, but I don't often make my own. Too scary! I think I may bite the bullet and try these. They look so good! These sound delicious! I always go weak in the knees for caramel. Homemade caramels, that is amazing. Its just something I don't see alot of people around here make. I must try. I just made these thanks to you. I have been craving salted caramels for weeks! Super easy to make as well. Luckily, I have honey directly off my parent's farm. It's nice to be with them on the holidays even if I can't be there. Thanks for the comments, they're greatly appreciated! I love that so many of you have access to awesome-sounding honeys to experiment with! Is this easy to cut? Thanks for a fabulous recipe! Your recipe for sea salt caramels looks great. I can’t wait to try it. Caramels are one of my favorite sweet treats, next to chocolate of course. Wow sugar and salt- I will have to try this!